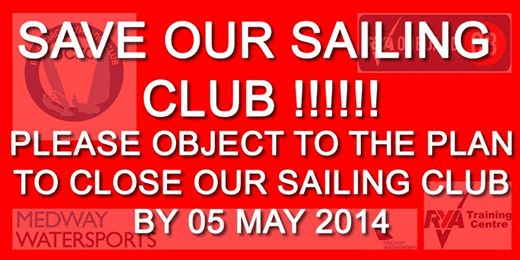 Save Blue Circle Sailing Club! Simon Pugh has contacted us to ask for help. Blue Circle Sailing Club is just on the edge of the Thames Estuary in Cliffe. The club is a small lake sited within an area of natural beauty and has been there since 1957. Unfortunately the landlord of the lake is seeking planning to fill in the lake to an un- sailable depth which will close the club completely. Many Medway/Swale boaters or their children have learned to sail at the club. PLEASE register your objection to closing this sailing and windsurfing facility. The quickest and easiest way to object is to click on this link or paste it into your browser address bar. Then fill the form in with your objection. Don’t forget to choose OBJECT from the drop down box. To see details of the application you can click on this link which also gives other ways to object. Why not come to the Boat & Chandlery Fair at Gillingham Marina and then take a walk over to the Medway Queen? The restored paddle steamer will be open to the public on 26 April from 1100 to 1600 hours, see www.medwayqueen.co.uk for details. A short five race series, boats’ four best results to count. Races are started from a committee boat normally located in or near Gillingham Reach. The first start each day is at 10.00. Races are short in-river races designed to get you back in the bar around lunch time. Racing is handicapped so everybody has a chance to win. You do not need a rating. Racing will be under IRC (if you have a current rating certificate) or the RYA NHC system. You do not need to have your boat or sails measured or weighed. Look up your boat’s base handicap on the RYA list on line and this will be automatically adjusted race by race in line with your performance. Full details can be found in the official Notice of Race and Sailing Instructions www.medwayyachtclub.com or by contacting Medway Yacht club by email myc@aol.com or on 01634 718399. As participants in an open event you and your crew are invited to join us in the bar at MYC (food available) after each race and for the prize giving lunch following the last race. The restored paddle steamer will be open to the public on 26 April from 1100 to 1600 hours, see www.medwayqueen.co.uk for details.